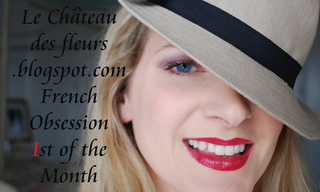 "Isabelle Thornton" Le Chateau des Fleurs: French Obsession Party #5 and giveaway! French Obsession Party #5 and giveaway! It's the 1st again! WOW July went so fast! I have a great give away for you! VERY French! I made this Toile knecklace just for you! Unique! It goes with any colored shirt too! Just love it! Winner announced on Friday August 9!. Link your post, not your blog. Anything French inspired! Link it back to my blog or display my French Obsession party button. Visit and leave comments! This is a great time to meet new friends! If you want traffic, Link up! Ohhhhh, what an absolutely FABULOUS necklace!!! I LOVE it!!! I am already a follower of your awesome blog!!! Your French Obsession button is on my sidebar!!! What a gorgeous necklace! I love how it can be worn with anything! Oh I would love to win! You are very crafty! I am a new follower of your blog! My cousin is from france and we attended his wedding in Paris recently. I love all of your photos! Love the necklace. Did you make it. I also follow you on Face Book. Hi, Wowww a fantastic and very gorgeous necklace! I love the colors...great choice on those to match everything! Your Giveaway's are just awesome! I would love to be able to proudly wear this very unique and lovely piece of yours! I'd show it off everywhere! Hi, I'm also a happy follower of your blog! I was so happy that I had found you some months ago! I believe it was when The babies in Heaven need a binky. That story had just touched my heart and I told everyone I know about since! That was just beautiful! Hope your day is a wonderful one! Thanks for hosting another fun party, Frenchy! I've been looking forward to it, and can't wait to see all of the participants! Hi, I have your French Obsession Party and Giveaway button on my right hand sidebar on my blog for everyone to see and in hopes they stop in at your awesome blog to join in the fun and to meet you! Have a beautiful day! Very nice necklace!! And you are right, it would go with anything! oooo I love that necklace! Aren't you clever? Thanks for telling me about your link party. I just linked up our trip to Montreal (so far!). I am a new follower! So glad you found me! I already adore your blog! Gorgeous necklace - I love it! I'm a follower. Oh, please sign me up for the beautiful necklace! LoVe this necklace! Pick me! Yipppeee, I love anything French inspired. Can't wait to check out the other linkers. I am a follower and I love the necklace! What a beautiful way to make roses--toile! Here's another comment for the necklace ;) It's gorgeous! I am a follower on Face Book, too! Looooove this necklace! Not only is it super chic and french...but you made it! Wow!! I hope to win! Hugs!! I also am already a follower and I loooove your blog, missy! Take care and chat soon! LOVE it Frenchy!! I've got you linked for tomorrows post girl! What a fun giveaway Frenchy!! I've been a long time happy follower! I love that necklace, great job Frenchy!!! I follow you very frech blog!!! thank you for organizing this party, c'est ma premiere participation....tres bonne idee! Hi Frenchy, thanks for joining the Rooster Party and displaying the Button. So happy to have you joining us. Very pretty! Love your blog! I don't know how this skipped my mind!!! THANK YOU for writing to me!!! I'm so excited to link up to your party today - thanks for telling me about it. I've only linked up a couple of times because I'm new to this whole blogging thing. Can't wait to check out all the other people linking up!!! Cheers! BTW - Love, love, love the necklace!!! You rock! lovely necklace. Thank you for such a great and generous giveaway. Thank you so much for bringing all this Frenchy goodness to one place....what a wealth of inspiration and ideas. Fantastic job Frenchy. Your blog is absolutely wonderful! And thank you so much for your sweet comment- made me smile. I'm following as well! Ooooo! LA LA! That is gorgeous!!!! The toile necklace is lovely, tres chic. I have been a follower for quite some time now and always enjoy my visits to your château. Your button is permanently on my sidebar ever since I was featured on your blog in June. I am a follower adn I am nuts for toile. I don't usually enter giveaways but thought I would take a chance on this one, as it is so very me!!! Thanks for hosting French Obsession. I am tweeting about your giveaway too! I agree that necklace is awesome...oh I would love to win it and wear it with pride..ehehhe!! I am now following you...and have posted your beautiful photo in my blog.. Very cute necklace. Please enter me. FAAAABBBB! Is everything you make sooo perfect??? I'm going to try to get this one!! Sorry I am so late. It took some time because had to take pictures off the screen to give readers a little feel for the colour and atmosphere in this film. Fabulous necklace - just love it. I am a follower and enjoy your blog. Zee necklace she is beautiful! Recently stumbled across your blog & soooo happy about it. Adore your necklace! Hope to wear it around my neck soon! What a pretty necklace. I would love to have it. I'm so happy to know the cutest Frenchy girl ever! That is an adorable necklace! Wow, my daughter would love this, you are talented! I already like you on face-book. This give away is now closed. The next one is September 1st!